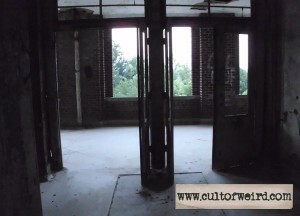 Is Waverly Hills really full of ghosts? Author J. Nathan Couch takes a tour of the infamous sanatorium to experience America’s most haunted place for himself. 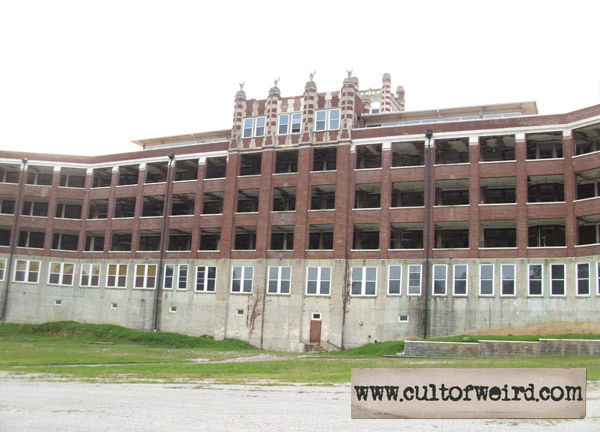 Ask any paranormal enthusiast to read to you from their bucket list and you’re practically guaranteed to hear “visit Waverly Hills Sanatorium” right away—assuming of course said enthusiast hasn’t already visited. 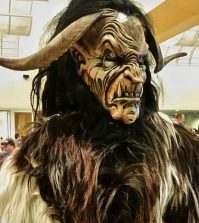 While some reputedly haunted locations shy away from such attention, the people at Waverly have whole-heartedly embraced it, turning the building’s black history into a supernatural cash-cow. The building has been featured on every major paranormal television series, was the subject of a feature-length documentary entitled Spooked, and legions of ardent paranormal investigators and curiosity seekers either tour the property or conduct full-scale investigations for a fee. Proceeds from such activities are being used to restore the building, which has suffered from decades of neglect and vandalism. 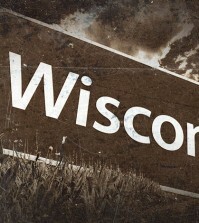 If any place should be haunted, Waverly should be it. The history of the location would best be described as nightmarish, if it wasn’t so very real. At the turn of the 20th Century tuberculosis—or “The White Death” as it was also called because the color it turned one’s skin—was a true epidemic and no one had the slightest idea how to treat the disease. As medical science struggled to cure this deadly respiratory infection, a massive open-air sanatorium was constructed in the hills outside Louisville. The current structure opened in 1924, replacing a smaller building that had been built years earlier. 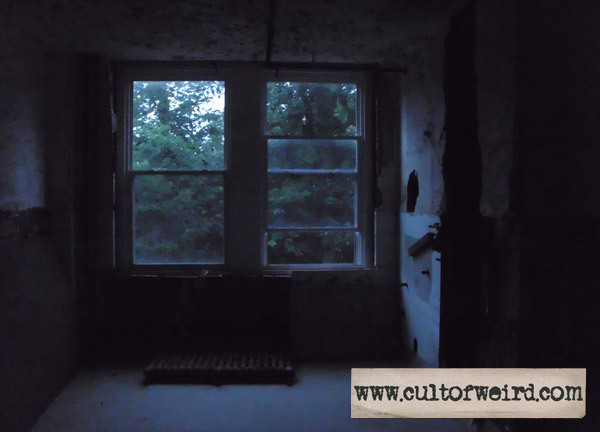 Innumerable patients were treated at the Sanatorium, however, distressingly few survived. During the height of the plague as many as a person an hour succumbed to infection. So many died their bodies had to be secreted from the building via an underground tunnel so as not to upset the other patients who soon could suffer the same fate. Finally, by 1961 a proper treatment had been devised and the need for a TB sanatorium ended. Waverly was closed down and, in 1962, the site became the Woodhaven geriatric facility. 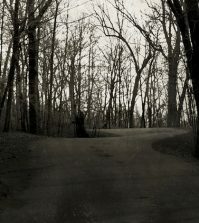 Woodhaven was closed down in 1980 by the State of Kentucky due to the horrid conditions and abuse endured by patients. In the decades that followed the grounds were methodically vandalized and became a nest for transients and troublemakers. In addition to the already-thousands of deaths which occurred during both the White Death and Woodhaven incompetency, there have also been allegations of both murders and suicides. Keep in mind this is merely the Cliffs Notes version of Waverly’s tragedies. On the night of July 26, 2013 I participated in one of their guided paranormal/historical tours. The site boasts a myriad of ghosts and paranormal phenomena. To list it all here would be redundant as the spectral troupe at Waverly is arguably the most well-known in America. Instead, I’ll focus on my own experiences at the Sanatorium. The path to Waverly takes you past a posh golf course where many of Louisville’s elite are enjoying one last round. At the end of a long, narrow lane a wooden sign post with tour information stands, the only hint about what lies just around the corner. After a slight bend, the Sanatorium suddenly appears in the evening sky—a hulking reminder of the area’s tragic past. There’s an interesting juxtaposition here, I’m simply not clever enough to articulate it. I was underwhelmed as the tour began on the first floor. The guides were doing a fine job, mind you. I think that perhaps the interior of the building itself was having a hard time measuring up to the decades of history and lore that surrounded it. Perhaps I was just distracted by the juvenile graffiti that had accumulated over the years, or the nervous whispering of my fellow tour patrons. Things began to change as we reached the second floor. As we walked from the solarium—an open air area for patients that runs the length of the wing we were on—towards a patient’s room, I noticed a shortness of breath and a headache beginning. I do not claim to be “psychic” in the least, nor would I say I’m “sensitive” to paranormal activity, but I have had similar experiences before while visiting or investigating allegedly haunted locations. After we all got within earshot the guide began telling a story about one of the room’s former residents, a young woman named Lois Higgs. 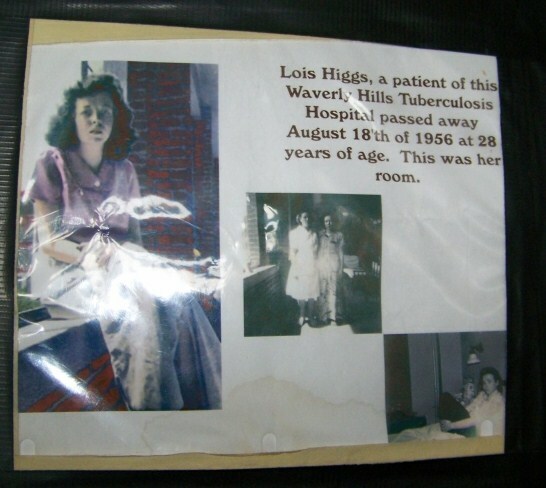 Lois passed away from tuberculosis in 1956. Numerous EVP (Electronic Voice Phenomenon) sessions have supposedly captured messages from her. Investigators and tour patrons regularly leave flowers in memory of the woman. A fresh bouquet of roses was present beneath several photocopied pictures of the woman. I noticed a bit of soreness and discomfort in my right arm and shoulder as the guide spoke. We walked across the hallway into the next room. This was a small, miserable room with one small, boarded-up window. The guide pointed out that sunlight and fresh air was once thought a prime adversary of TB, thus the solariums all over the building. 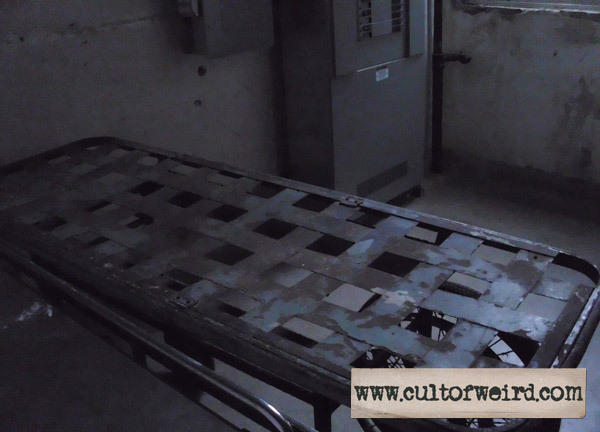 These dark rooms were where patients were taken when the medical staff had given up hope for them. Even before the guide had told us the nature of the tomb-like rooms, I noticed my heart rate quicken as I entered. I thought that these various symptoms I was experiencing were peculiar. I’m not the least bit claustrophobic, nor was I feeling “spooked” from the building or the stories. I’ve been in plenty of supposedly haunted locations. I should also point out the temperature and humidity inside the massive concrete structure was mild for a Kentucky July. A cool front had come through and a breeze was circulating through most of the building. As we left the second floor I began to feel better. By the time we finished with the third and fifth floors, it was now growing dark outside and a flash light was needed to navigate the stairs. We stopped on a landing where we were told a cautionary tale by the guide. In recent years trespassing has dropped off since Waverly was opened to the public, largely because of security guards and the installation of numerous cameras on the grounds. However, a couple of local teen boys had recently broken into the building with a hatchet. A security guard heard a loud scream come from the fourth floor. When he arrived the teens were screaming, “They won’t let us out!” The guard calmed them then asked who they were talking about. “The people in the stairwell! They won’t let us out!” The guard walked over and easily opened the doorway to the stairs and showed them no one was in the stairwell. As the guide said this I heard the sound of several women laughing. It seemed like the sound was coming from up and away from us, as if it came from the floor above. I should point out there were numerous women on our tour, but everyone was in the stairwell, packed tightly. A few patrons had been murmuring and giggling during the story, but this laughter seemed farther away. Perhaps this was an echo of some sort, but it was intriguing considering many of Waverly’s most famous apparitions are female. As we walked onto the fourth floor we were shown the hatchet marks made by the panicked kids. Before we entered the fourth floor we were instructed to turn off all electronic devices—anything that’s a potential light source. The fourth floor has a reputation for being the most active area of the property, and shadows are regularly seen moving across the hallways. Numerous tour patrons were asked to walk, one at the time, arms out, to a point nearest a bend in the hallway and stand perfectly still while the rest of us watched. It did seem as if shadows moved across the floor by the patrons. After a patron ran back to the group after feeling a cold spot and hearing a noise behind her, I volunteered. As I stood there I noticed a cool breeze from the nearby solarium, but I heard nothing. I did notice a shadow in a room to my right from my peripheral vision, but it could have been a trick of the light. 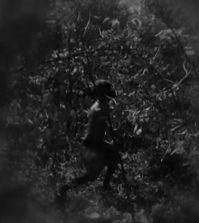 The whole time I stood there people remarked shadows were moving all around. I was amazed, but as the phenomenon continued without waver, patron-after-patron, I began to question it. The hallway is very long, and because of this it seems to narrow as you look down it. The rooms are evenly spaced apart the entire length, with natural light coming through the doorway of each, creating a stripped dark/light/dark pattern as far as the eye can see. This fourth floor phenomenon is an optical illusion called spatial aliasing. This occurs with reoccurring patterns at great distances. Basically there is too much detail for the human eye to deal with, and it causes this bizarre effect. An easy way to see spatial aliasing at work is to stand far from a chain-link fence and stare at it while walking the length of it. The pattern of the chains will appear to swirl or bend. Cool stuff, but not supernatural. After the tour I stood near my car looking at the awesome structure, taking in all my experiences. A fellow patron and I started discussing the tour. She remarked that whenever she’d touch the wooden handrails in the building and noticed how they’d been worn smooth by the hands of so many who’d died tragically or suffered in the building, she’d tear up. As we continued our conversation I began to notice a small orb-shaped pinpoint of light moving across the second floor solarium. It was the size of a firefly but a blue-white color, and it would disappear only to reappear with perfect timing in every other window. My companion asked if I could see a blue light. I said that I could. We watched as it traveled the entire length of the west side of the building heading east. At first it appeared as if it was inside the building, but as it progressed it moved up above the solarium windows in front of the exterior brick. When this happened it became two separate identical points of light, spaced so closely they almost touched each other. When the light neared a bend in the building—the sanatorium is roughly question mark shaped—we lost sight of it. The light(s) traveled roughly 350 feet in approximately 10 seconds. I did a quick scan for anyone else in the parking lot. A couple was standing a few car lengths away taking photos. I quickly asked if their camera had any type of laser pointer on it. It did not. They hadn’t noticed the lights we’d seen, but that wasn’t surprising. The orbs were so small it surprised me that we had seen it. It wasn’t some sort of reflection, because solarium windows didn’t have glass. This was the most intriguing event of the night. I suppose someone could have been playing with a laser pointer, but it was blue-white not the usual red color. Also, the light seemed to almost instantly change from one point of light to two evenly sized points of lights. 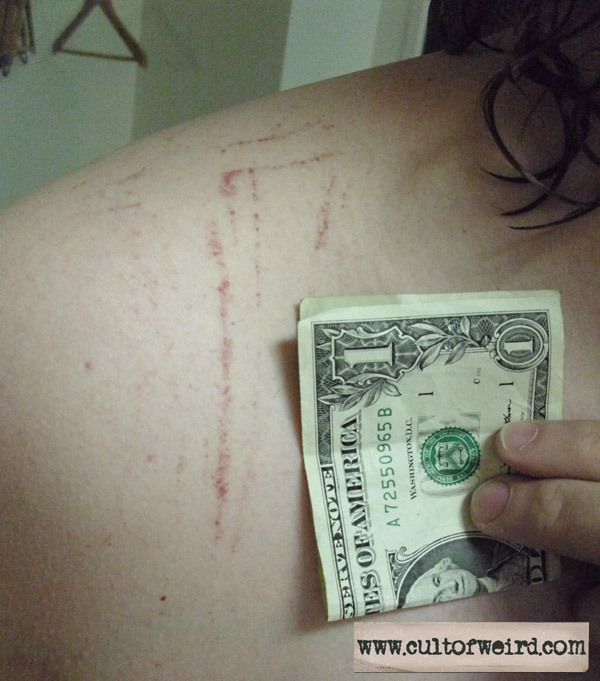 Scratches from Waverly Hills ghosts? I went back to my hotel room and after a lot of winding down, managed to fall asleep. The next morning as I was walking from the shower my wife exclaimed, “Where’d you get those scratches! ?” I walked over to the mirror and sure enough I had several large, broken blood vessels on my right shoulder. They were vertical, horizontal, and diagonal in pattern. I wondered if perhaps they were caused by carrying my heavy backpack and a cloth shopping bag the previous day. When I first arrived at the hotel I had only enough time to check in and secure my belongings, as I still had to find a restaurant before my tour started. I didn’t shower or change clothes before the tour, and I had carried the majority of my stuff across my right shoulder. However, I then noticed a couple of similar marks on my left shoulder. On my left, I had only carried my laptop bag, which has a very comfortable padded strap. Was this caused when I began feeling sick on the second floor? I regularly play the role of baggage-mule on family vacations and I’ve never caused broken blood vessels anywhere on my body. I can’t say with a hundred percent certainty that these odd marks are a supernatural manifestation, but after having experienced everything I did, I firmly believe Waverly Hills is haunted. Four days later and the marks are starting to fade. Lois Higgs was my great grandmother. She had a son, my grandfather while she was an occupant at Waverly. She passed away when he was five. I’ve heard so many stories about what a great woman she was. I do think Waverly is haunted, but not by my great grandmother. I believe she is in heaven with my grandfather and her husband. That sounds like a really cool tour to go on. More large, historical abandoned buildings should do tours like that. My brother and I went on a tour. I brought a voice recorder with us and was recording the entire time. we were on the fourth floor when we heard foot steps all around us. Our group had went right while we went left we were by ourselves at the end of the hall the recording has the steps and had a voice telling us to move. We had another voice on the third floor but couldn’t make it out. Great article. I wonder if there is a connection to “sick building” syndrome (who knows what you were inhaling up there when you were getting ill) and paranormal activity?